Because what’s the point of having a baby if not to make him wear the most ridiculous hats? 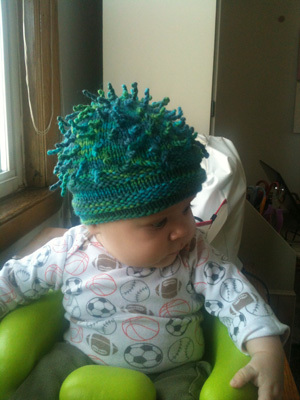 Pattern: Anemone Hat by Cat Bordhi, smallest size (baby). 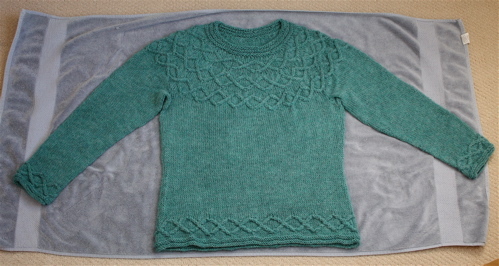 Yarn: Lorna’s Laces Shepherd Worsted in Beverly. I thought this blue-green-turquoise colorway was perfect for making a hat resembling an anemone! I knew I needed to knit this hat as soon as I saw it profiled on the Lorna’s Laces blog. It’s just obscenely cute, don’t you think?!? I knit the pattern exactly as written, opting for the simple brim rather than the moebius one. On the plus side, the yarn machine washed and dried extremely well, and the hat used up only half a skein of yarn – so I can make another as a gift! And of course Gregory has been getting many compliments on his awesome new hat :). Adorable. But you’re going to have to chunk out a hat more often than every two weeks — way too long to get another fabulous Gregory pic! I just made the same hat for my grandson! Love your version, too! So cute!!! I absolutely love it! What a precious baby!! Nice hat, beautiful baby boy! We have the same sports onesie! The hat looks super cute on him. He is just so adorable! You are soooo right. This hat is ridiculously cute! He really is the lovliest looking baby. Super hat – takes a oretty cute face to carry off such an extreme look! Your version is incredibly cute, as is the model. Love it! That is just hysterically cute. I recently purchased this pattern and after seeing it on your cute son I must make it for my goddaughter. I love it!!! I forgot to add I must by this color! He is THE most precious baby. It also helps when you put it on a ridiculously cute baby! That is hilarious. My husband calls it blackmail material, but it only truly reaches the “show the girl/boyfriend” level if the wearer is also doing something completely weird. That is absolutely adorable! That hat would make a real “talk of the shower” gift. And Gregory, as others have observed, is just cute as can be! Your baby is so cute it should almost be illegal. That is what we call “too stinkin’ cute”! Just adorable — and so is Gregory! Mistake in the title. It’s not the hat – it’s the baby. He’d make anything look impossibly cute. 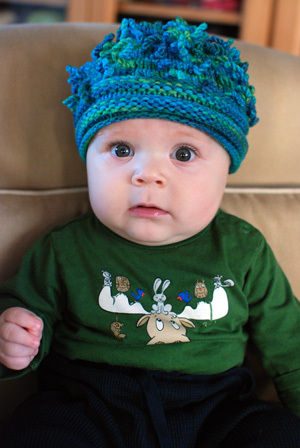 Oh my, but your baby in that hat is cute overload! Love it. Such an adorable baby! Love the hat – now I want to make one too. I amazed people even notice the hat on that ridiculously cute kid! That IS a cute hat and, in my opinion, looks even better after the wash.
That is adorable! I just love the look on his face in the last picture. It’s priceless. Cutest hat ever. And also cutest model. 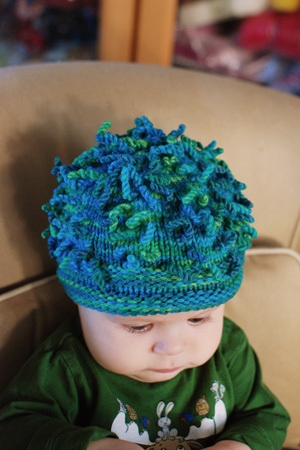 And now I *really* want to knit one of these for my little munchkin! Kind of makes me want to run my fingers through his “hair,” ha ha. Sitting up already?!? too cute!! l agree, what are babies for if not for being knitting models 😉 adorable! you are so funny. love the baby face and the hat – adorable! The hat is so cute – – – but Gregory is the cutest of all!! He is just the cutest baby!! Would love to chomp on those cheeks! I’ve made 4 of these hats already. I just love knitting them! It’s absolutely darling on a baby! OH my gosh! Soooo cute!! Definitely putting that in the queue. He looks adorable in it! !